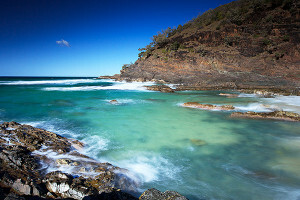 Interested in spending a day photographing the best of the Noosa National Park, from surf to sunset? Book our Noosa National Park Workshop/ Day Tour. This course will focus on capturing iconic Australian land and seascapes, while sharing some of our favorite and special locations with you. During the day we will visit many locations and explain and demonstrate the ideal conditions & time of day to capture the best of Queensland’s Noosa National Park. We’ll visit popular locations including Alexander Bay and Sunshine Beach, and also visit some not so well known favorite spots and vantage points. We will show you how to capture iconic ‘blue water’ images that show off the unique beauty of the National Park. After a day in the sun we will shoot sunset – Noosa National Park and surrounding townships offer a range of interesting sunset locations. Location will depend on our expert assessment of the weather and tidal conditions on the day. Expect a fun, but long day. Exploring, taking in and capturing the beauty of the Noosa National Park. David has spent countless hours traveling throughout the park, and will show you where the best spots are. A reasonable level of fitness is required as there will be a large element of walking – expect around 4 kms during the course of the day. Travel to and from Noosa National Park, starting at a central location in Brisbane. A full day (mid-morning until after sunset) of ‘hands on’ instruction, location scouting and shooting (travel time included). Good walking shoes, and a sunhat are a must. The workshop caters to a maximum of six (6) students. You get plenty of one on one time during the practicals and it makes for a more relaxed learning environment. Please note, there is a minimum class size of 2 people and being an outdoor workshop we are weather dependent, postponements are possible especially in the stormy months of the year. Not ready to book right now? Sign up for our newsletter, to find out about later sessions. Having seen first hand Kane's enthusiasm and eye for composition during his recent trip down to Armidale, I believe anyone who goes to one of his and David's workshops will not only learn heaps, but come out with a whole new appreciation for photography. Copyright 2019, Grasstree Photography. All rights reserved.